These floor model booths make efficient use of floor space and are designed for batch powder coating with no provisions for powder reclamation. Air is drawn in through the open front of the spray booth, passes through the booth's working area into the filtered exhaust plenum. The air is filtered in three stages and discharged back into the room. One set of filters will be provided with each booth. 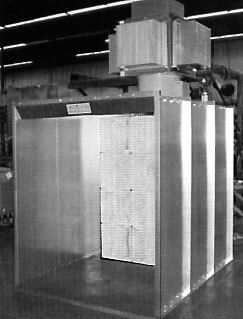 All booth and plenum sections are fabricated from 18 gauge prime galvanized steel. Structural steel is used to add strength and rigidity to booths as necessary. All panels and support members are precision punched for easy nut and bolt assembly. Panel flanges are connected externally to provide smooth internal surfaces. Bright full booth illumination is provided by four tube, Class I, Division II, inside access, 48" long, 32 watt, fluorescent light fixtures placed in the ceiling panels. All fixtures are UL listed and approved for their intended use and placement. The light tubes are not included with the fixtures. All hardware, installation instructions and sealants needed for the booth installation are included. The control panel and other electrical components may be purchased separately. All Spray Booth products comply with all OSHA and NFPA regulations.